Aromatherapy began, in present form, in 1928 when R. M. Gattefosse (French) coined this term for the alleviation of health problems with essential oils. Roots of the therapy actually go back at least 4000 years when plants were used as food, cosmetics, medicine, mood alterers and in ritual. Use fell off in the 17th century but essential oils were still used in the perfume industry in France and it was from this that modern aromatherapy started and spread. It is said that Gattefosse, who was a chemist in his fathers perfume shop stumbled upon the healing properties of lavender oil when he burn this arm in a bunsen flame and plunged it into a bowl of lavender oil. He was intrigued by the rapid and complete healing and so started to research the effects and properties. Jean Valnet and other French doctors also developed the use of essential oils. Essential oils are produced by one different methods of distillation using many parts of the plant. 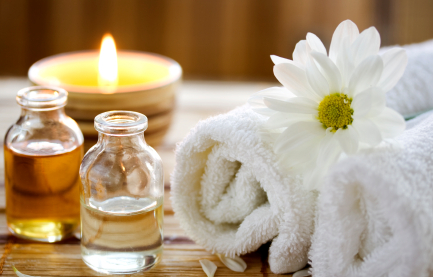 The most common application of aromatherapy is massage with essential oils. However, massage is not always appropriate soother methods are used. Massage - usually 3 drops in 5ml base oil, e.g. sweet almond or sunflower oil and apply. Elderly, children and those with sensitive skins 1 drop in 5ml. Base oil should be chosen to complement the effects of the essential oil used. Baths - Maximum of 8 drops in drawn bath and soak for 15-20 mins. Babies, children and elderly, 1-3 drops only and diluted in full fat milk/vodka to ensure dispersion in the bath. Compresses - about 20 drops essential oil added to 1-2 pints water (cool or hot depending on condition) and area covered with cloth impregnated with the oil and water. Inhalations - 2-6 drops essential oil added to 1-2 pints very hot water and inhaled, usually to clear some respiratory problem. Vaporisation - 5-10 drops essential oil dropped onto water in a receptacle above a candle which is then lit. Oil and water then evaporate with the heat and fragrance fills the room. Douches - used for urinogenital infections. About 5 drops essential oil added to 1 litre of boiled, cooled water and used in a sitz bath, bidet or as external local wash.
Toiletries and cosmetics - e.g. lotions, aftershave and hair products contain essential oils to alleviate skin and hair problems. Internal use - Rare in UK. Only provided by practitioners with extensive further training and special insurance. Essential oils enter the body by inhalation or through the skin and transfer to the blood stream via the nose, lungs and skin and by means of perfume, massage, baths etc. When inhaled theessential oils are thought to affect the brain directly by means of neuro-chemical messages which affect our moods and emotions. These may then give rise to complex chemical changes in the body such as increased lactation or libido and the release of encephalins and endorphins which act as the body's natural pain killers and produce sensations of well being and calm. Essential oils can act very quickly or over longer periods of time, they are then excreted in respiration, sweat, urine or faeces. It is not known exactly how essential oils do work, but their effects are becoming well known. Indeed, some oils may not be appropriate for certain groups of people in certain circumstances (epileptics/pregnant women). Therefore, caution should always be paid before use. An aromatherapist, on first treatment, will take a detailed medical history and question the client about lifestyle inorder to built up a complete picture. This enables the therapist to provide a specific and holistic blend of oils and treatment. Patch tests areoften given to ascertain sensitivity to particular oils. Frequency of treatment varies with individual, severity and duration of the condition. Aromatherapy is also a preventative or maintenance therapy and most people would benefit in some way from treatment, especially massage. Treatment is for the whole person - mind, body and spirit - as essential oils works on all levels and affect the whole being. It can also be used to alleviate specific physical symptoms. Aromatherapy can be used alongside allopathic medicine and most other therapies, with the exception of homeopathic (risk of the essential oils nullifying the effect of the homoepathic remedy.